Hey guys! Sorry I haven't been around much this week, I've been on a "mini-vacation"- barbecues, fireworks, nature walks, bike rides and family fun! Thanks for sticking with me! To all of my fellow Americans, I hope you all had a safe and fun Independence Day! To everyone else, I hope your weekend was great as well! I ended up doing a patriotic themed makeup look- eyes were MAC Crystal Avalanche, MAC Basic Red pigment and Urban Decay Liquid Liner in Radium. Nails were Rescue Beauty Lounge Underwear with Love My Nails Glory on top. I didn't get a chance to take a picture before I left for the fireworks, but my nails didn't look too good anyway - that stringy glitter is SHARP! It pokes out everywhere and scratches you!! OUCH!! Turquoise swatches for Carla G.
...and a bunch of random swatches! I like doing random swatches. I have nail polish ADD. Just so this post isn't too pointless, I'll leave you with a picture. This is the Rescue Beauty Lounge "New French Manicure." It's Medium White on the tips with two coats of Clear Pink on top. You can see that the white isn't stark white- it's a little cream or even bone colored. 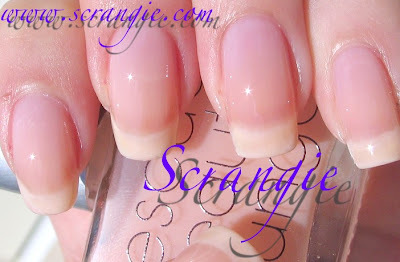 The Clear Pink just adds the barest hint of tint and milkiness to the rest of the nail. This is actually really natural looking for a French.... This is what my nails look like when they aren't stained blue or red or yellow. Very natural, pretty, clean and delicate. I'm not generally a fan of the traditional French manicure, but I would wear this. And with that, I'm off to catch some frogs and try not to melt! That's a very pretty American manicure! So, I need some recs for an opaque white polish. A non streaky one I can use on its own and as a base for sheer colors like Misa sugar daddy:) Something I can get at H2T please! TY!!! Your nails look gorgeous as always! My old standby white is OPI Alpine Snow. It's a very bright white. A little bit streaky, but I've found that thinning it with a little thinner helps somewhat. Another good white is Orly French Manicure White Tips. It's very opaque, but if I remember correctly, the brush is smaller. I'll have to go find mine and check, but I think it is. Oh yay, vacation! Sounds like you're having a great time, fantastic to read about! I need a preview of your Benefit Erase paste review! Did you hate it? Because I sure did! Looking forward to the next week of posts. Wow, I sounded a little demanding, didn't I? Sorry about that - I'm kind of braindead today. Interesting that you say it would make a good foundation; I returned mine, otherwise I would try it. It's so thick and melty, it's like lip balm almost. Weird for concealer, but it spreads so easily it's like it was almost made to be foundation. Too bad none of the colors really match me. Boo!